Starting June 1, 2014, T-Mobile will increase their reseller pricing further! In order for us to continue selling this product online, we have to charge 2% extra so we will not be losing on this product considering the costs of selling this online. However, you still save with us compared to local store or directly from the provider since we don’t charge sales taxes! 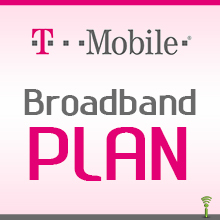 T-Mobile broadband number is required to be provided in the shopping cart, and refill will be directly loaded to the provided broadband number. HOWEVER - after your purchase, you still need to call T-Mobile to convert this load to "BROADBAND DATA PASS".